Discussion in 'Frontpage news' started by Hilbert Hagedoorn, Feb 24, 2016. Nvidia dx12 performance is lost, game over AMD won. Fascinating review Hilbert, thank you. Yep, brand new API and an Early Access title. Good way to make your mind up about a card. It's pretty impressive -- definitely shows how hardware Async can improve performance in heavy compute situations. Whether or not most games will experience that, I guess is left to be seen. By the time any real DX12 title is released, Polaris/Pascal will probably be out and I'll be looking to upgrade. It's highly possible that Nvidia was too late into Pascal's design to remedy the hardware Async problem. That would be good news for AMD, as they could come out strong in the first iteration of DX12 products. Hilbert, where the fury x @? Hahahahahahahah at all those fanboys on reddit who defend nvidia dayin dayout. Fury non-X beating 980ti? Lovely. Dont worry though, Nvidia will give us Pascal GPU's so you can throw out your Maxwell cards *cough cough Kepler. Not sure if the crazy quality stuff is relevant - it's like running any game with extreme amounts of tesselation to make AMD's cards perform worse. 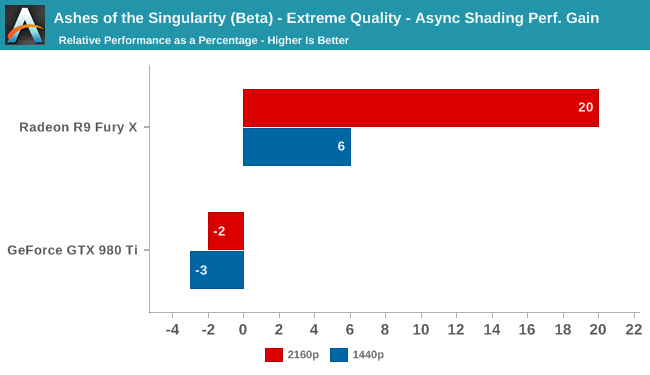 It's pretty clear to me that the performance advantage of AMD in DX12 is pretty darn small and this is a title where async compute actually makes a big difference, and we have to go to extreme lengths to prove that AMD is faster. Nvidia's DX11 performance is something to marvel at. As marked in the chart, the 380 used had only 2GB whereas the 370 has 4GB. I deliberately threw it into the mix to show memory dependencies. Fcat requires DVI hence I only used cards with a DVI output. Once I get the new fixed AMD driver I'll redo the Radeon cards and include Fury X as well. Anyone else feel this game spent too much time in the headlines of tech websites? Can't even count by now how many times we had Ashes benchmarks. Graphically game looks ugly and bland, and it's niche game engine for niche game genre which will never be used anywhere else except maybe another Stardock game. Definitely not a great DX12 showcase, rather disappointing. Would be nice to have benchmarks and performance reviews for other DX12 games and other engines for a change, more popular ones, which would be relevant to broader audience of gamers. I'd love to do that, but name one that is available and a proper DX12 title ... yep, that's the problem eh ? Ashes is the only one focusing on this strongly. Until actual DX12 class games are available just be glad you see some of its potential in articles like these ? Well there are Fable Legends Beta benchmarks. Which is probably closer to what actual games are going to be like under DX12, as it's developed under a special UE build by a Microsoft Studio. But most people wrote it off because Epic has previously been partnered with Nvidia, even though they literally stripped all of Nvidia's tech out of their engine for UE4. Oh no worries - I want more DX12 titles for testing as well. On Fable, Microsoft cherry picked just three or four websites for Fable. It smells and was rather shameful. We contacted Microsoft about it, and thus far they are not distributing it to any other media (for whatever reason). On Fable, Microsoft cherry picked three or 4 websites for Fable. It smells sorry. We contacted Microsoft about it, and thus far they are not distributing it to any other media. Yeah, I figured that. I think that's more of Microsoft being dumb then then foul play though. I think there are going to be a lot more DX12 benchmarks/titles and whatnot popping up when UE4.11 final ships. There is a lot of underhood changes to the renderer in .11 including tons of DX12 changes. I believe Paragon is already running on it, as they utilize a number of the new rendering features.